Combining food coloring with frosting allows you to create specific hues of the color spectrum, such as grey, ranging between white and black. Making the correct color frosting helps you portray the appearance you want for cakes, cupcakes or cookies, adding to an overall theme for birthdays, parties, showers and weddings. Grey frosting can highlight the décor of an “Over the Hill” cake; can represent a child’s favorite animal such as a shark or elephant; and can create the color of a castle for a wedding or party royalty theme. 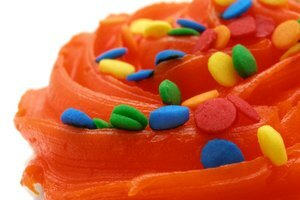 Artificial coloring does not affect the flavor of frosting and can be kneaded into fondant or stirred into icing and buttercream varieties. Scoop the contents of white or vanilla store-bought frosting out of the container with a spoon and into a bowl. 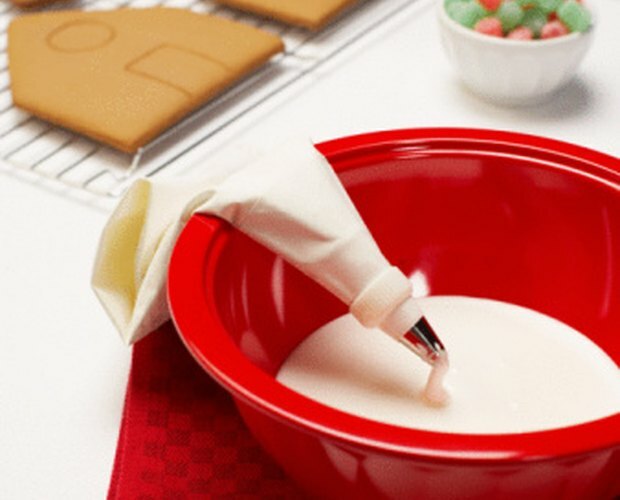 Whisk two egg whites in a bowl if you choose to make your own fondant frosting. Add 3 cups of confectioners’ sugar in 1/2-cup increments to the egg whites. Stir the sugar into the mixture until the mixture becomes smooth. Add one drop of black or purple food coloring, depending on the hue of grey that you desire. Black food coloring produces a dark grey, versus purple coloring, which provides a light grey with a hint of purple. Another option is to combine yellow, blue and red food coloring to make grey because the three colors neutralize each other. Stir the food coloring into the frosting or paint and knead it into the fondant with your palms and knuckles. Check the color. Add more food coloring for a darker hue. 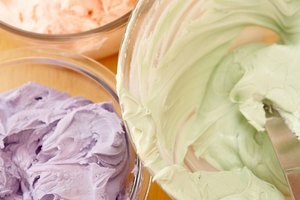 Lighten the color of the frosting by adding more frosting or by dropping in a white or yellow food coloring, if the grey becomes too dark.